Kiwifruit, often referred to as kiwi, is sweet fruit that tastes like a mixture of banana, pineapple and strawberry. It's an oval fruit about the size of an egg. Kiwi also goes by the names Chinese gooseberry and Yang-tao. Kiwis are rich in vitamin C and low in calories. 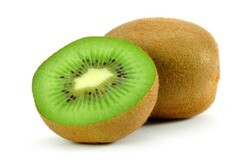 A medium sized kiwi contains about 45 calories, 0.3 grams of fat and around 11 carbs. When purchasing a kiwi, choose one that is brown green in color and feels medium soft. If the kiwi is too soft, it might have gone bad. Every part of the kiwi is editable, even the fuzzy skin. Most people prefer to eat the kiwi without the skin though. The skin can be easily removed by dipping it in boiling water for about a minute. People allergic to pineapple or papayas are likely to be allergic to kiwi. Prepare a loaf pan by lightly greasing it with oil or butter. In a large bowl, sift the flour and baking powder. Add the butter, sugar, eggs, and vanilla extract. Beat the mixture until it is smooth. Stir in half of the chopped kiwi. Sprinkle the remaining chopped kiwi over it. Bake the kiwi cake for 45 minutes to 1 hour, or until firm and golden brown. Remove from over and let stand 15 minutes. Turn out and finish cooling on a wire rack. Garnish the top of the frosting with kiwi slices. Share You Favorite Dessert Recipe On Wizzley! Had not idea you use kiwi in a cake. Looks scrumptious. This is probably the healthiest pound cake you can ever make.The secret ingredient is raw zucchini, which give this cake both its high fiber content and added moisture.